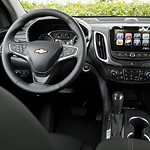 Safety on the road is paramount, and that is why the Chevrolet Equinox focuses on providing drivers with unparalleled safety in all types of road conditions. One of the biggest advantages the car offers is the forward collision alert and automatic braking system. These two systems work together to keep drivers safe when they move at low speeds, optimizing driving in city streets. Intelligent headlamps can also provide drivers with additional utility and functionality in difficult driving scenarios. The high beams will turn on in specific weather and atmospheric conditions and then revert back to low beams when the condition has passed. This can provide drivers with additional peace of mind wherever they go. If you want to see what options are available for you, check out Basic Auto Sales. It has never been easier to find the perfect selection for your driving needs.